We drive past this rather modern looking church fairly regularly whenever we go into the city. Each time we do I keep reminding myself that I’ve been meaning to stop and take a few shots because of those attention-getting blue doors. Recently I finally did take a few minutes to explore it a little closer. You can see bare pavement and even a little grass in some of these shots because they were taken a few days before this week’s latest Snow-mageddon. 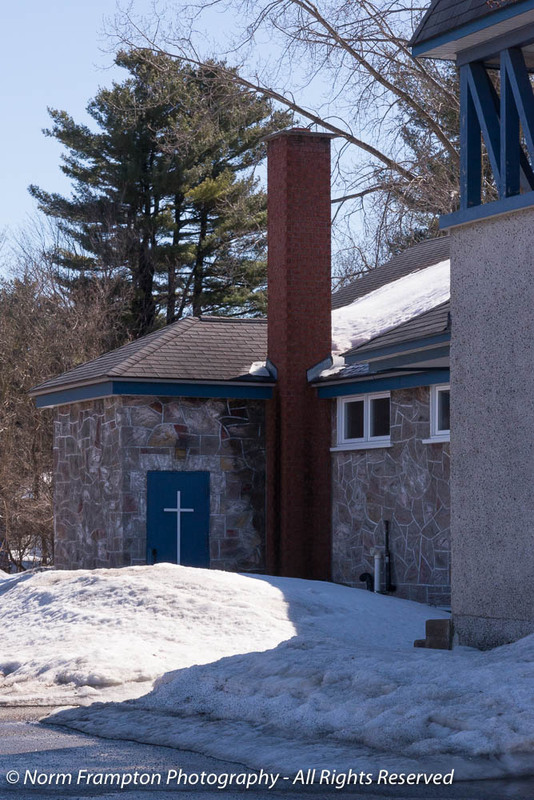 I wasn’t able to find out much about this place other than it was built in 1949-50 and is one of several bilingual Catholic churches in the Lanaudière region northeast of Montréal. 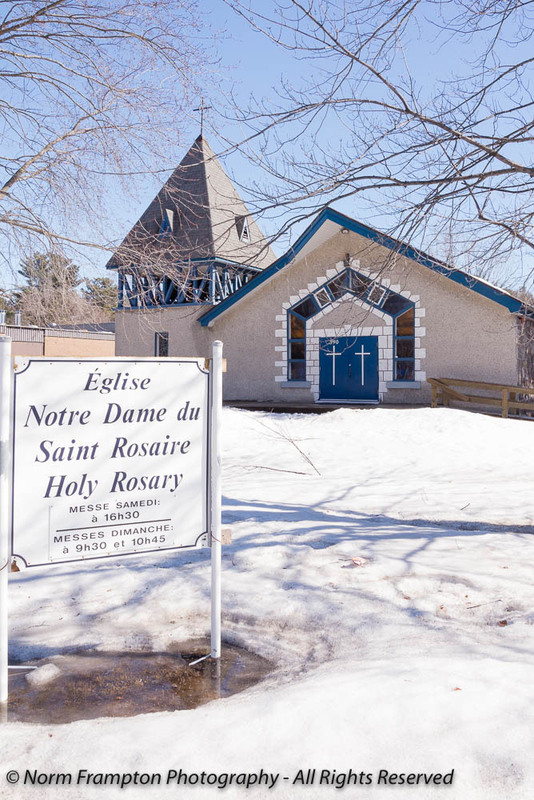 In fact a full bilingual website for a Catholic church in Québec is somewhat rare, but this part of Mascouche Heights used to have a high percentage of English speaking residents. I’m not sure how well those bells are holding up to being so exposed to the elements year round. I did find some older pics online where the trim and doors were a reddish brown colour. I love the reflection of the tree in this shot – too bad the photographer got in the way. 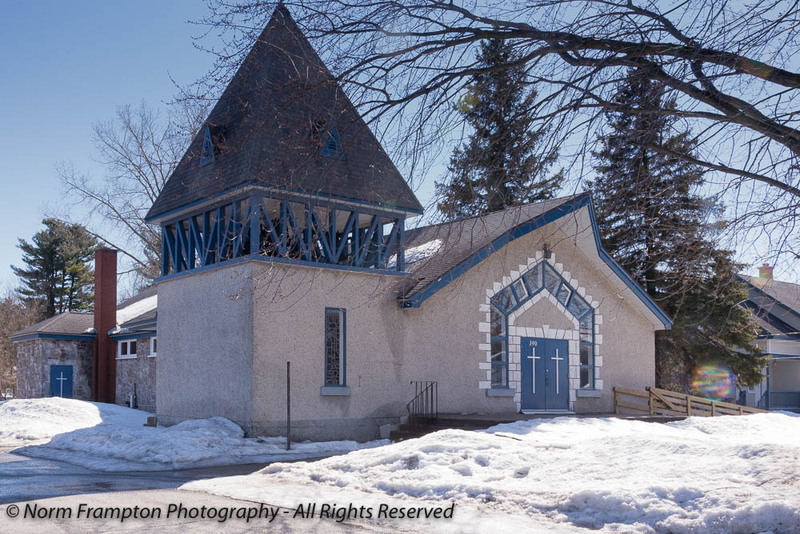 Gallery | This entry was posted in Photography, Thursday Doors and tagged blue doors, Canada, Church, Doors, Mascouche, Mascouche Heights, Québec, Thursday Doors. Bookmark the permalink. I like the shape of that church. It’s unusual. I like those blue doors. Love those blue doors! Here are some Mexican faux painted gate doors, for once not as colorful as yours! The next time I paint my house, I think my doors will be cobalt blue. I’ll send a pic. Maybe there were some creative souls who had imput on the color. I like it! 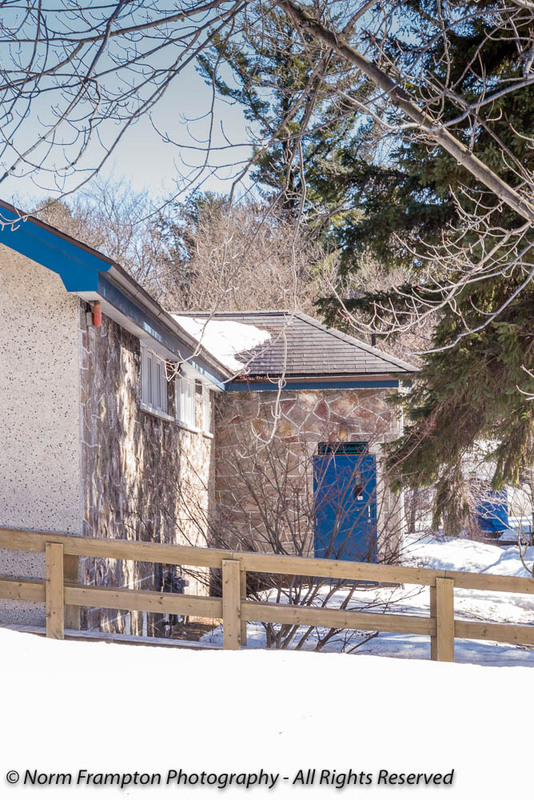 The blue is bright with the snow, but it probably is not that “blue” when the snow is gone! I like it, since my favorite blue to paint with is ultramarine blue, which is a little darker, and more leaning to the purple side. Am not an expert, but in Europe all the bells in towers are exposed to the elements, so they probably do something to take care of it! The church really has a cool design and the blue adds empahsis to it. Loved the windows around the entry doors; great find! I love this church! 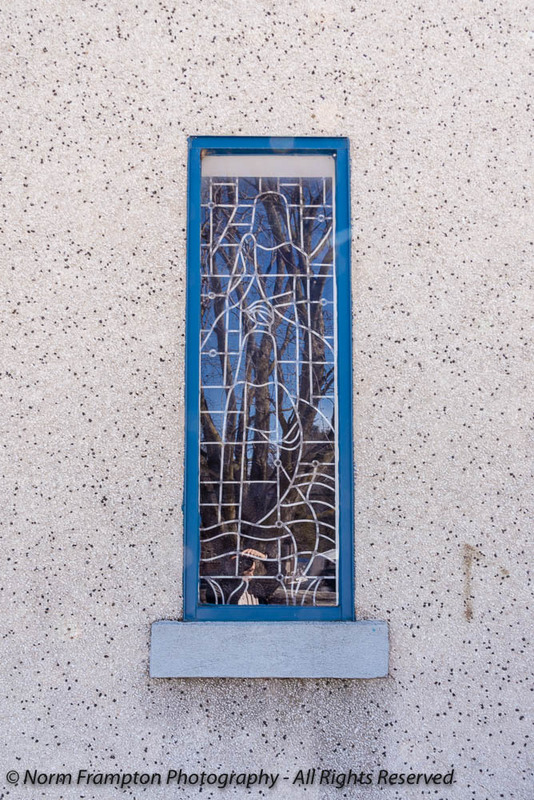 The stone plus the blue plus the stained glass panels are great mixes of colors and textures. The style is so weird, with feelings of the modern and the old at the same time. Great design, IMO. Thanks Marian. It is a very unusual design for a church which is probably why I notice it every time we drive past. Hi Norm. Lovely church door pictures:) Ive posted some literary doors I recently photographed. I think I did something wrong with the linky. Sorry I was on my mobile. My blog home page came up instead of my blog post. Thank you, Norm. Sorry to give you more work. No worries, it happens. The most work comes from the ones who don’t use the link-up list. It gets hard to find everyone’s post when they’re not all in the same place. I can’t follow everyone so it forces me to double-check every pingback and then do tag searches…. These are great doors. When I see blue doors by themselves, it’s my favorite color. When I see them on a page with red doors, I get confused. If you add a black door or two, I go crazy. Thanks for keeping it simple today, Norm. As much as I like the doors, I really like the bell tower. Thanks Dan. It’s an original color choice for a church but I think it works. That bell tower design is quite different too. Lovely blue church doors! I have some blue church doors of a different sort, this week. I wouldn’t call it a “funky” blue, Norm. Since my favorite colors have always been shades of blue and purple, I’m drawn to this church. Given the gray stone, that blue gives the church a needed lift and says “come to me,” without screaming too loud. What a beautiful church! I’m glad you took your pictures in the winter – the snow adds a lot to the setting. Those doors certainly grabbed my attention, hard to miss, aren’t they? Do you still have snow, Norm? They sure do stand out Jean. Yes we still have lots of snow. We got another 35 cms here on Tuesday/Wednesday and in the city they got close to 50 cms. All of the main roads are clear but some of the side street still need to be cleared. With the walls and stone colors I think this choice of blue is lovely. Especially in the winter with all the white snow! Of course I’m a HUGE fan of blue and white anything. 🙂 It’s a lovely church. Thanks Deborah. I thought so too and I’m glad I finally stopped to explore it. That blue does make it pop! Fixed it. Not sure why but the link you used was invalid/incomplete. Have you tried using the “get shortlink” tool in the post editor? No. I’ve never even heard of it before. I will try it next time. I don’t have the option of get shortlink tool in post editor. I am only using the most basic form of WordPress. I’m using the basic (free) WordPress as well. Not sure what to say. I thought the “get shortlink” tool was available in all versions. No matter, I plugged in the correct link. Hope you are not too buried in snow down there Norm! Thanks Lynn. Not too bad here north of the city. We only got about 35 cms. In town it was worse, some spots got up to 47 cms. The city says it’ll be another 4-5 days before they get it all cleared. They haven’t even touched the side streets near my moms place yet. 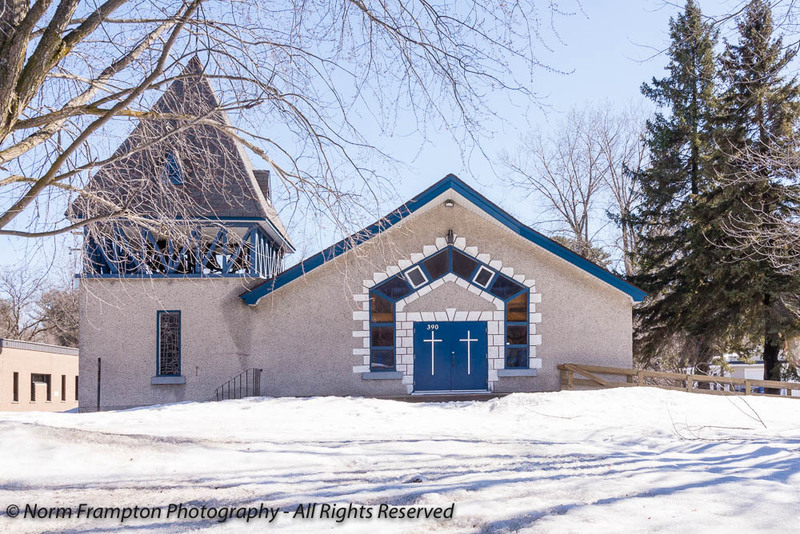 It is rare to find a church designed in the modern style that is truly beautiful, this one is. Norm, when you get a chance, would you remove my first link? It goes not to my TD entry but to the weather for Yosemite! Evidently the “copy” for TD didn’t take the first time. 😦 Thanks. Thanks. 🙂 It was that sort of first fifteen minutes of the day! 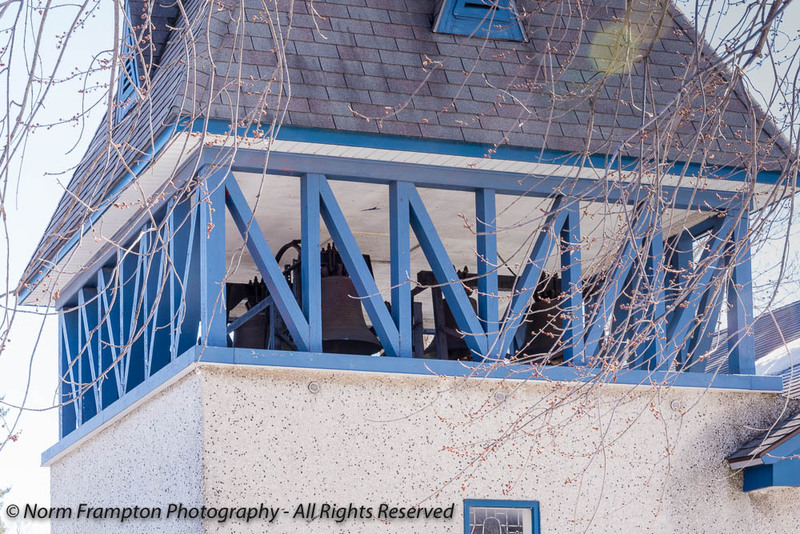 That bright blue looks so cheerful and I really like the designs around the door and on the bell “tower”, although I wonder about exposure to the elements as well. 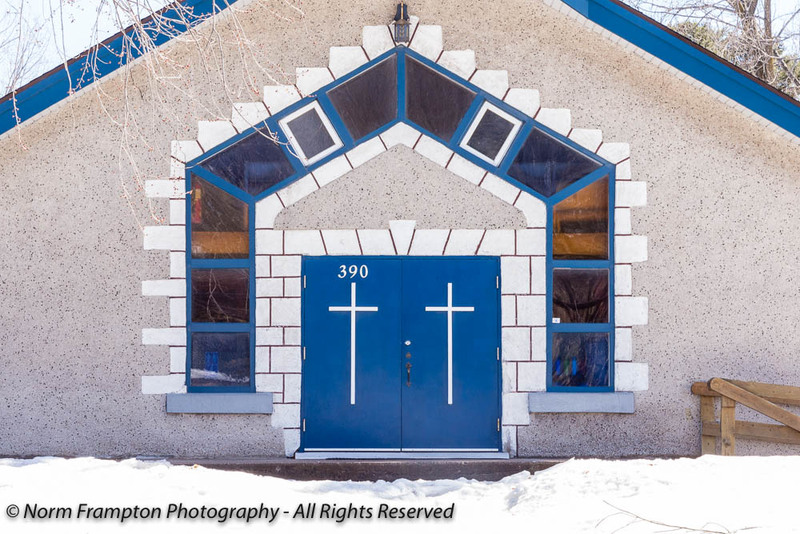 How well the blue suits this church, especially in the snow. I can’t imagine any other colour would work nearly as well. Ugh – isn’t that the truth!! Thanks Ian. I’m not familiar with that song – I’ll have to look that one up.